This article is about the Soul Shards mod. You may be looking for the item called Soul Shard. The Soul Shards mod allows you to create a Soul Shard that absorbs the souls of monsters you kill to be inserted into a Soul Cage later. This Soul Cage is a special block that can spawn the type of mob your Soul Shard was absorbing, usually at much better rates than a vanilla monster spawner. This mod's cages can spawn monsters normally unavailable with vanilla spawners. In addition, higher tier shards can spawn mobs regardless of the light level, and can react to a redstone signal. The soul of most vanilla mobs, passive or hostile, can be stored in shards. This does not include bosses, like the Wither Boss, nor does it include villiagers, iron golems, snow golems, or squid. This does, however, include Angry Zombies. The Soul Forge is a special block that corrupts metals and diamonds when fueled by Corrupted Essence - a necessary process in the creation of a Soul Shard. In order to craft a Soul Shard, you will need to cook 1 Diamond in a Soul Forge with 8 Corrupted Essence. 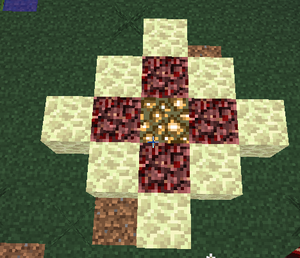 Corrupted Essence is made by cooking Soul Sand in a furnace and combining the resulting Vile Dust with Glowstone Dust on a crafting grid. The actual Soul Shard must be made in a Soul Forge by putting in a diamond in the top slot and 8 Corrupted Essence in the fuel slot. It takes a long time (about 11 minutes) but creates 3 Soul Shards at a time. Once a Soul Shard is made, you can begin to gather souls. There are 5 tiers of Soul Shards, each tier requires an exponentially increasing number of souls. The Soul Forge (corrupted essence, corrupted Ingots, vile swords) no longer exists and the soul stealer enchantment can simply be gotten on any weapon/book with enchanting. Soul Shards are now created by placing a block of glowstone, then placing a block of netherrack on the 4 sides of the glowstone, then placing a block of endstone on each side of the netherrack, afterwards you right click the glowstone block with a diamond to get 1 soul shard. In addition, all the blocks in the structure become endstone, requiring you to re-make the structure to make another soul shard. This does make endstone farmable in the overworld at the cost of the component resources. This process requires: 1 Diamond, 1 Glowstone Block, 4 Netherrack, 8 Endstone. In order to charge your Soul Shard through this method, you must place the Soul Shard on your hotbar. Next, find the mob in which you want to "tie" the shard to and kill it. Your Soul Shard will now be linked to that mob type and will only gain charges by killing that mob. For example, if you want an Enderman Soul Shard, your next kill after placing the Soul Shard on your hotbar has to be an Enderman. Souls of mobs that have been added through a mod cannot be captured. Killing mobs from a Soul Cage mob spawner WILL NOT generate soul charges. However, mobs spawned from vanilla mob spawners will charge the Soul Shard, so it may be wise to build a grinder. Slimes souls are particularly easy to farm. Smaller slimes that spawn when killing bigger slimes provide souls, even if the big slime was spawned by a Soul Cage. You can also add the Soul Stealer enchantment to a sword, which increases the number of soul charges gained per mob kill by one for each level of the enchantment. For example with a Soul Stealer level 2 enchantment you will get three soul charges for each mob killed instead of one. The highest level of Soul Stealer available via enchanting is 4, however by combining weapons or a book you can get level 5. Soul Stealer 5 results in 6 souls per kill. Right-clicking on a vanilla mob spawner with a Soul Shard in your hand will destroy the spawner and add 200 souls to the shard. Note that the shard must already have at least one of the mob's soul inside for you to be able to right click a spawner. Although mobs generated from soul shards do not have a soul, mobs generated in MFR auto-spawners do, making this a very efficient way to quickly obtain souls at the cost of Mob Essence and power. You still have to deal the killing blow yourself, obviously. Once you have the desired tier mob spawner, you next craft a Soul Cage. Place the Soul Cage in the world and then right-click your Soul Shard onto the cage. Attempting to insert an inappropriate Soul Shard (such as a Tier 0 Endermen Shard) will do nothing. If you mine up the Soul Cage, you will receive the Soul Shard back, as well as the Soul Cage. Mobs from the Soul Cage will spawn in mid-air next to it if you wish to make a fall damage trap. This page was last modified on 27 September 2017, at 22:28.